Former President Mahinda Rajapaksa who commanded 5.77 million votes (47.6%) at the 2015 Presidential polls was barely able to muster 4.95 million votes (44.7%) at the recently concluded Local Government Elections, Finance and Mass Media Minister Mangala Samaraweera said. 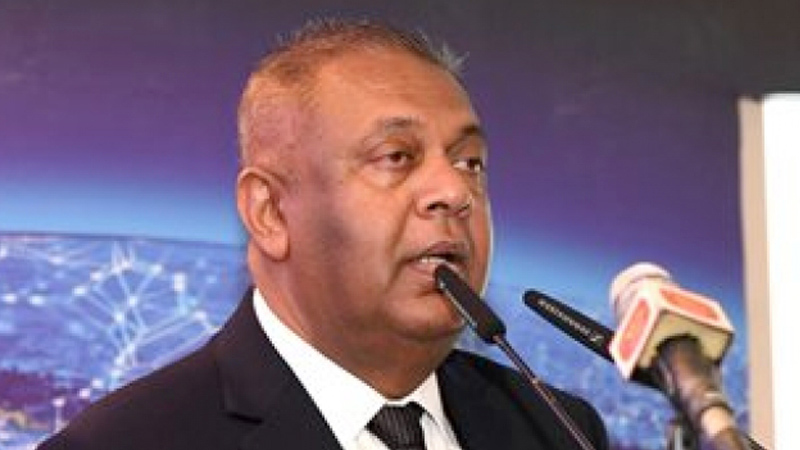 Issuing a press statement on the outcome of the LG elections, Minister Samaraweera yesterday noted that a resounding majority of citizens numbering 6.1 million (55.3%), marched to the polls last Saturday and voted against a return to Rajapaksa rule. Taking note of the election results, Samaraweera however said; “Today, the people told us that we have not done enough. Despite the sincerest of efforts to inject haste and independence into a dilapidated justice system over the last three years and empower the police with the tools they need to successfully investigate complex crimes, murderers and fraudsters remain at large. Despite our government being the first in the nation’s history to insist that ministers must resign from the cabinet at the first sign of wrongdoing, and indeed the first to investigate allegations of corruption within its ranks with such vigour, justice is yet to be served,” he added. He stressed that “the message from the people has sunk deep into the UNP” and that the Government is “committed to taking drastic measures to fulfill the promises made three years ago and maintain the public trust”. “Our duty is to broaden our own voter base by delivering results, while joining hands with all honest and democratic political forces to uplift our motherland and ensure that Sri Lanka never again returns to rule by the sword. That is our calling and we must not fail. Our democracy, our republic, depends on it,” he added. “On the 8th of January 2015, fifty one percent of Sri Lankans voted for the vision put forth to them by our unity candidate Maithripala Sirisena: that the time for dictatorship in our country was over, and that those committed to re-establishing democracy in Sri Lanka must unite to ensure that government serves all of the people, and not a single family and their loyal disciples. On that day, the United National Party, several stalwarts of the Sri Lanka Freedom Party, the People’s Liberation Front, the Sri Lanka Muslim Congress, the Tamil National Alliance, the Democratic People’s Front, and altogether over 30 political and civic bodies came together to prove that Sri Lankans shared their vision of a Sri Lanka that was ruled by law and not through fear. We promised to amend the constitution to restore independence to the public service, abolish the executive presidency, and enshrine the rights of all Sri Lankans into the legal bedrock of our legal system. We promised to bring those who robbed the coffers of the treasury to justice. We promised to hold accountable those who quenched their thirst for power with the blood of brave journalists and peaceful protestors. Most of all, we promised you a government that would be free of the rampant corruption that defined the decade that came before us,” he said while emphasizing the efforts made in the right directions to fulfil the above obligations. “As we embark on this chapter in the story of our democracy, Sri Lanka can be proud of two remarkable things we saw last Saturday. The first is the conduct of an election under the auspices of an independent elections commission and police service. Never before has a government shied from manipulating public personnel, funds, resources and state media into an organ of their political ends. We hope that under these independent bodies, Sri Lanka has seen the last of corruption, intimidation and violence marring our elections,” he concluded. You need to be honest. You can spin the data another way too. 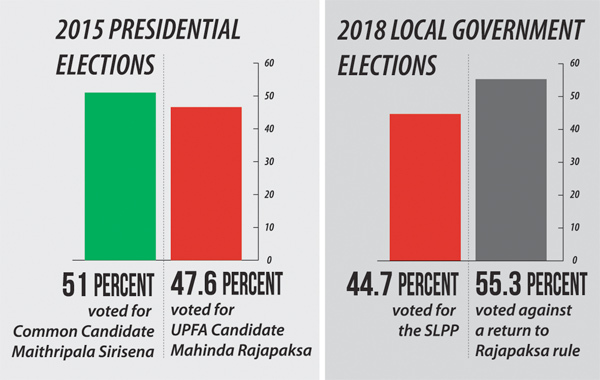 Instead of adding SLFP and UPFA votes to the UNP total add that to the SLPP percentage. 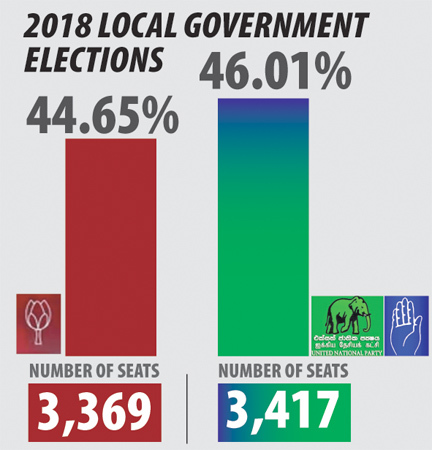 44.65% + 8.99% + 4.44% voted AGAINST the UNP which means 57.99% did NOT vote for the UNP. In the interest of transparency you can look at the data so many different ways. The bottom line is SLPP control 73% of the Councils now. UNP was beaten like they were beaten in 1970 and SLFP was wiped out even worse than how they were beaten in 1977. So think it through before just spewing ideas. Some people can think things . Protecting the criminals by voting is a crime. After two terms of rule MR should exit respectfully. People already given their verdict. Why can't MR RETIRE respectfully and let the rule of law set by this government take its cause. I never believed that he has a hormonal imbalance and today after reading this I realized that it is true. He needs immediate medication.